This is a party I'm a little late to so you may have already heard of this. 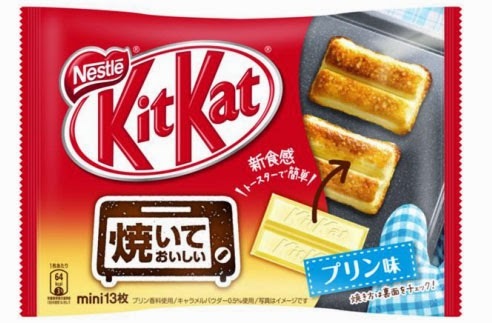 Nestle Japan is offering a KitKat that you can bake and it won't turn into a melted pile of goo. It's supposed to brown up and taste like custard or vanilla pudding. Apparently, this is availabel at the Chocolate Cafe in Ikebukuro in Tokyo. The cafe is open from 10:00 am to 9:00 pm (except closing at 8:00 on Sundays and holidays) so you can get your baked KitKat on between those hours. You're supposed to bake them for 2 1/2 minutes in a toaster oven at 1000 W. They say you should put foil down on the tray first and keep an eye on it because it could catch fire if you overdo it. This is the brainchild Yasumasa Takagi, their chef in residence it would seem. The concept is supposed to yield a result which turns the outside the texture of candy-like sugar, caramelize the flavors, and create a unique textural experience once it has cooled down to safely eat. This sounds like an absolutely awesome concept, but I have my doubts that it will be a great flavor experience. Still, if these come up in shops around here, I'll certainly buy one and try it. A bag of 13 bars is 525 yen (about $5.25). It will be available from March 24 for general purchasing at supermarkets. Let's hope that a spate of housefires are not the outcome of this experiment. I'm not gonna lie I'm a bit jealous about this. I love anything that has to do with white chocolate. Thanks for sharing that experience, Sherry! I agree that 525 is too much - it's Nestle Japan's retail price! If I find these, I'm pretty sure I'll try them for the novelty, though the sweetness level does sound discouraging. If you try them unbaked, which I also did, they are way too sweet IMO and I don't mind sweet stuff. Baked they aren't too sweet to me, but they are still really sweet. Watch them as you toast them. They don't appear to be doing anything then are just suddenly really brown. It's probably easy to burn them if you aren't careful.